Usually made of metal or acrylic, a space maintainer is a dental appliance that is used to maintain the space where a tooth has been lost and the permanent tooth has yet to come in. When our doctors recommend space maintainers, they will most likely recommend one of the following four options. This type of space maintainer is used to maintain the space for one tooth. One side is wrapped around the tooth to secure it, and the other side has a metal loop to maintain the necessary space. A distal shoe space maintainer is made of metal and usually used for slow-growing molars. The maintainer is inserted into the gum line where it will hold the space as the dentist monitors the surfacing of the molar. This type is most often used when multiple front teeth are missing, and the space needs to be maintained. The device is fixed to both sides of the mouth on the molars. Crown and loop space maintainers are very similar to the unilateral expect that the metal loop is actually affixed to a crown to ensure there is enough space available for new teeth. Why Would You Need a Space Maintainer? Space maintainers are often utilized for children who have damaged or lost teeth before their permanent teeth are ready to break through. Since children still have more teeth coming through when they experience tooth loss, permanent fixtures such as crowns do not work. 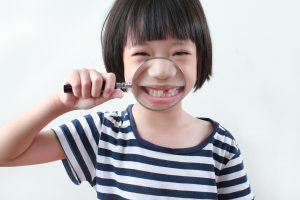 Maintaining this space for children is extremely important, as open space can cause their teeth to shift requiring later orthodontic work to correct their smile or bite. The space is also necessary to ensure that the permanent tooth will have plenty of room to come in without pushing behind or in front of neighboring teeth that may have shifted. Do Space Maintainer Require Special Maintenance? It is essential that your child maintain proper oral hygiene to help their appliance last longer and prevent decay on the other teeth. Children with space maintainers will need to avoid gum, hard candy, or other foods that can be hard to chew. Overly sticky foods should also be avoided, as they may become caught in or damage the device. You will also want to schedule regular check-ups and see our dentists if there seems to be any movement or discomfort as it is possible for the appliance to begin to shift over time. Our dentist will also need to monitor the progress of the teeth below the space maintainer. If your child has had premature tooth loss and you would like to learn more about the different space maintainers and which type may work best for your child, contact Orthodontics by Birth, Stewart & Fletcher today to schedule your consultation.